1. Since there were power cuts last night that had the kids up and crying at three AM, (they hate the dark) they slept in until 8:30 this morning, giving me tons of time to write before they woke up. Beautiful. 2. 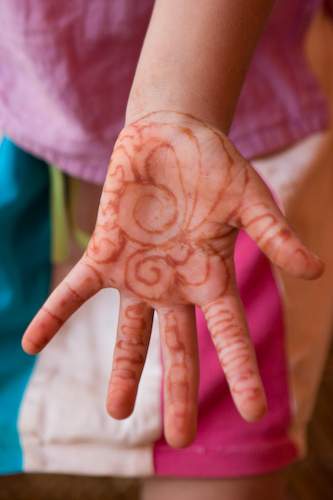 Mendhi on the kids. On their hands and whiskers on their faces. A beautiful woman who came over for lunch yesterday took the time to doodle on everyone with henna. 3. I've been taking Saturday mornings to go off by myself, sometimes for a ride on the scooter, or sometimes for a walk on the beach. I need it after a week of school and community life and work. Today Becca and I went for a swim together and then we lay on the beach for awhile, which I've never actually done here. It was like heaven. 4. Jocelyn, a girl from Canada who has been with us for three weeks and now is going back to Canada, sang a duet with Chinua at a concert tonight. There were people sitting on pillows and lanterns everywhere, dim light that lit the faces up all around. I love Jocelyn's voice and her music and the two of them sounded beautiful together. (By far the most talented people there... cough cough, did I say that out loud?) I wish she wasn't going home. But she's in a band called Treelight Room, and they're doing this mildly important thing called "touring" when she gets home, so. There's that. 5. And then, at the point in the concert when Leafy was so tired that he was dropping, and Solo was wide awake in the sling for a few too many hours, banging his little head against my chest, I called my landlord, who is a taxi driver, to see if he could get me home. I walked to the concert, but didn't feel like I could make it back with the sleepies. He came, and drove us home, and then he didn't charge me. Grace! Here we go FIVE. Heat version.